A rainbow table is a lookup table offering a time-memory tradeoff used in recovering the plaintext password from a password hash generated by a hash function, for example Windows passwords. This is quite a sophisticated password audit tool. This method was developed by Philippe Oechslin for quick password recovery using pre-calculated tables. It's enough to say that the sought password can be recovered within minutes or even seconds. The program supports the standard *.rt, indexed *.rti, and hybrid tables. Multithreading is supported as well. It must be mentioned that the rainbow attack does not guarantee the recovery of all passwords, but the probability of the recovery is close to 100%, depending on the tables you've got. 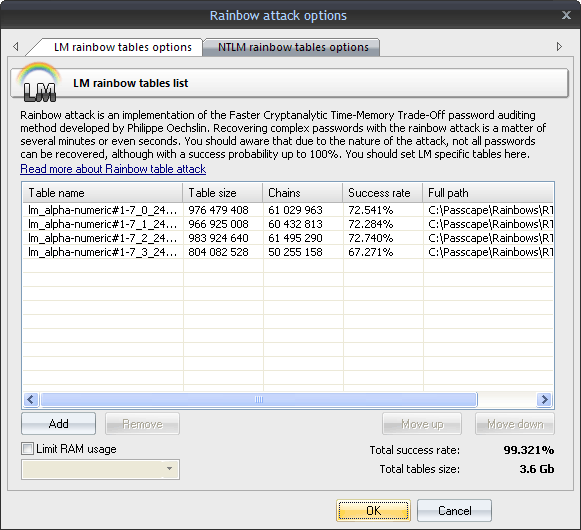 A specific rainbow table can be implemented for the hash it was created for. Eg. LM specific tables should be used for breaking LM hashes only. The attack options allow limiting the amount of RAM that can be utilized by the attack when using old computers (the attack assumes using large volumes of RAM for its calculations).